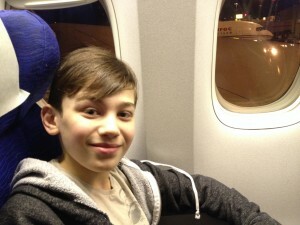 Just about five and a half years ago, I strapped on a backpack and boarded a British Airways flight from Montreal to my first overseas destination. I hugged my little nieces and nephews farewell, showing them on a map my bewildering tangle of planned global destinations. Two years later, when I put out Wander the Rainbow, I dedicated the book to them. And yet, somehow, that didn’t feel like enough. Just as travel writing inspired my world journey, so too the next adventure: about three years back I caught an article about an uncle taking a tween-aged nephew on a trip to the UK; I surveyed my sisters, who enthusiastically endorsed the notion; with my frequent flyer balance growing once more, I matched award dates with school holidays…and am now sitting on another British Airways triple-seven with Jackson, my eleven-year-old nephew, on his first-ever voyage out of North America. Of course, no journey of mine seems to start without some hitches: this time around, an almost three-hour delay on my transcontinental leg from San Francisco; an overnight delay of my round-the-world backpack — a first for it after roughly 80,000 miles on its odometer; not to mention the fact that I’ve never traveled — nay, been alone for more than an hour or two — with a child before. Was this voyage headed for disaster before we’d even left the Americas? I didn’t manage to sleep at all on the plane, and arrived wrecked at Heathrow as we cleared Customs and hopped on the Heathrow Express. We headed out of Paddington Station’s bustle, dropped our bags at the hotel, and proceeded on what turned into an Indiana Jones-like quest to obtain a local SIM card. 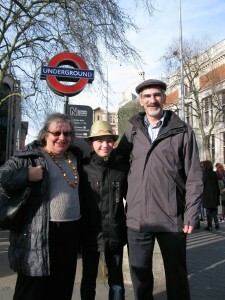 Finally we got one; with a local number I texted everyone far and near and headed on the Tube to see the folks partly responsible for my and Jackson’s entire existence, Sidney and Ray Lightman. It’s been almost three decades since I met the Lightmans for the first time… And yet I’d be hard-pressed to see much of a difference in Sidney, who’s pushing ninety. He’s as sharp and witty as always, and regaled Jackson with stories of me and his grandmother in our respective youths. Ray, who’d been in up-and-down health through the years, was looking quite good. We didn’t stay long, as I was so out of it I think I was almost starting to hallucinate. So back we headed to our hotel — a cute little spot in a row of Georgian townhomes near Paddington — where I broke my cardinal jetlag-avoidance rule (not for the first time) and took a nap. Jackson, of course, was fine — he slept a bit on the plane and has boundless energy and enthusiasm greater than I’ve ever had, even at his age. Looks like we may have a new world traveler on our hands. 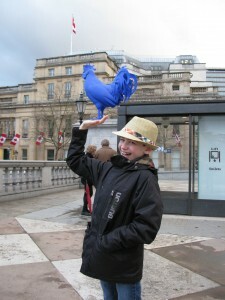 We didn’t want to leave Day One at that, though, so with umbrellas in tow we headed out for a preliminary reconnoiter. Walking east past Marble Arch we strolled down Oxford Street, bustling with shops and crowds and vendors selling Belgian waffles drizzled with chocolate (had to have those, of course). Turning down Regent Street, we ducked through the narrow muddle of Carnaby Street toward Trafalgar Square. The stone lions around Nelson’s Column greeted us in their solemnity, broken up somewhat by a giant blue chicken sculpture astride Canada House. Continuing our meander, we reached the Houses of Parliament and Big Ben. “It’s big!” Jackson remarked as we stared up at the huge clock face. Oh, that probably elicits an “obvi!” (As my California boyfriend would put it) but in my travels I’ve grown accustomed to landmarks seeming smaller than they appear in photos. Jackson marveled at the detail of the Gothic Revival stone carvings; he never fails to be fascinated with new things. 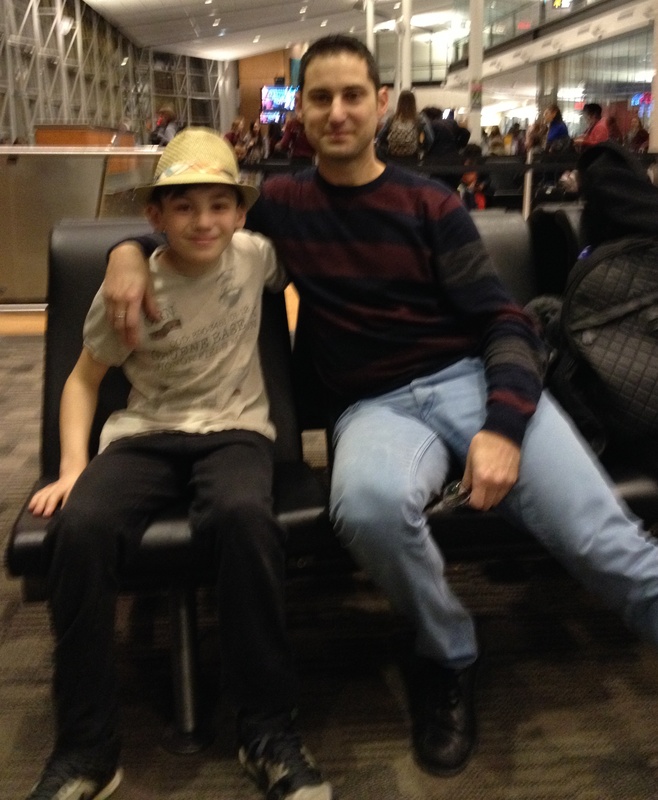 Chalk another one up for his incipient traveler genes. 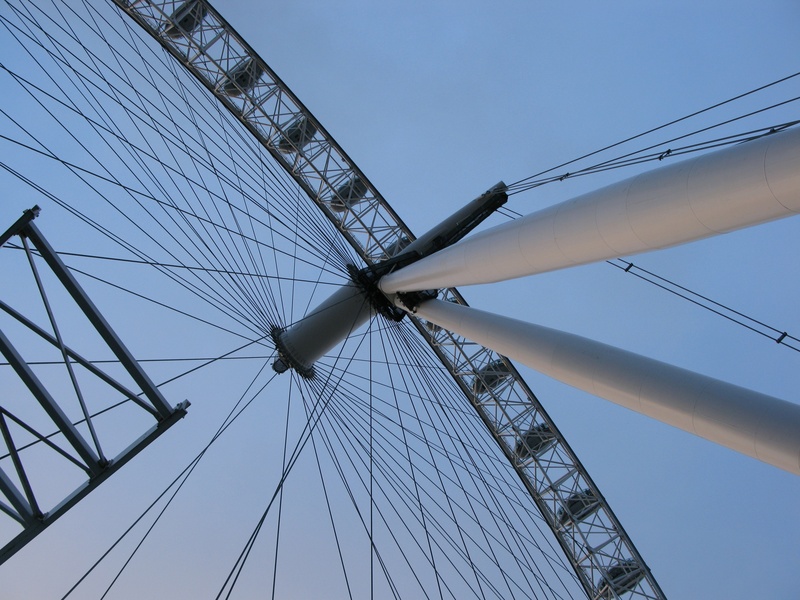 Coming back to London with a first-timer meant that doing the more conventional touristic sights was back on the agenda; as in all my travels, I had that question running in my head: is it worth it or just a tourist trap? I pondered that as we bought tickets to the London Eye and were ushered into their experiential “4-D” intro film (actually quite good). 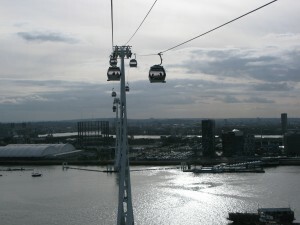 Lines were short to nonexistent as we entered one of the Eye’s capsules and began the slow, smooth roll up to the top. It was dusk and the day’s clouds were clearing. 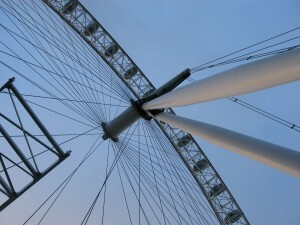 The Eye was an even better experience than the Singapore Flyer (which I did visit on my big trip), being in the middle of one of Planet Earth’s biggest and busiest cities, with few skyscrapers to block the view (though more are going up every year). It was dusk during our spin, perfect for watching the lights come on across the breadth of the metropolis. After a hop to Leicester Square for a bite of dinner, we headed back and tuckered out early; my afternoon nap in no way dissuaded my body from crashing and getting eleven hours of sleep. We awoke not too early the next morning and headed east — to explore London’s origins and bits of its present and future. We got off the Tube at Tower Hill (actually not a tube at all: we took the Circle Line, the much-maligned part-surface route that now sports new trains — golly, why do Londoners complain about their sprawling, efficient Underground?) Just up the way, that icon of Old England: William the Conqueror’s White Tower, part of the complex of edifices known as the Tower of London. 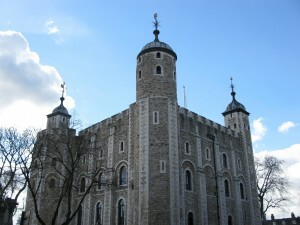 We arrived just in time for the 11:30 tour care of the Tower Wardens; it was just as gory, comedic, and delightful as I remember it from last time I was here, as a lad not much older than Jackson is now. 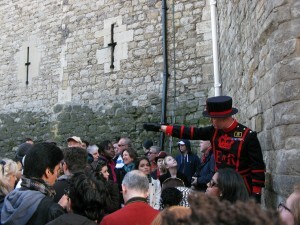 A smattering of tourists meekly raised their hands. “Sorry ’bout that!” He said. The crowd guffaws. 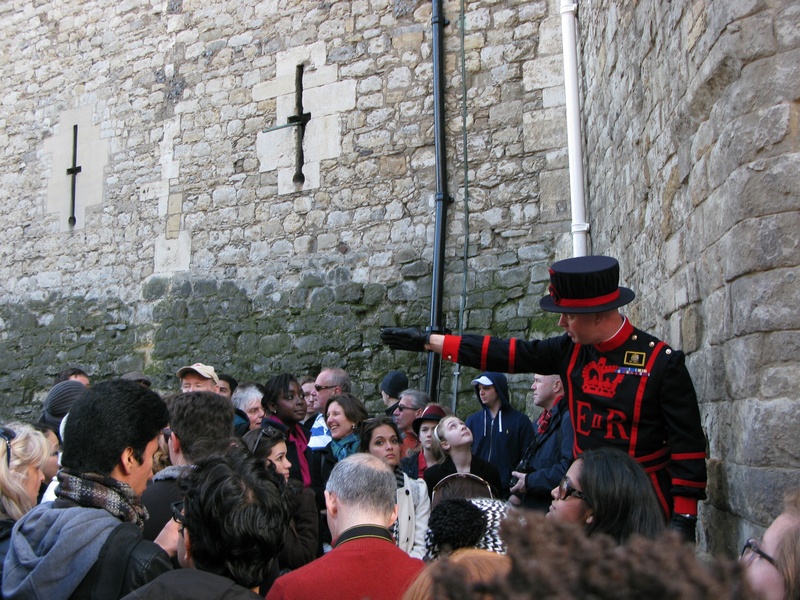 The tour took us through early English history, replete with palace intrigues, imprisonments, and more than a few beheadings. Afterward, we stood on the moving sidewalks through a dimly-lit chamber to check out the Crown Jewels. Those Royals sure know their bling. From Tower we headed to Bridge — Tower Bridge. Although it’s a masterwork of Victorian engineering, the bascule drawbridge is all Gothic-y styled, presumably to match the Tower next door. Looking at all those gears, pistons, and coal-fired boilers, it’s remarkable to consider that it was only the second bridge to span the Thames as late as 1894. 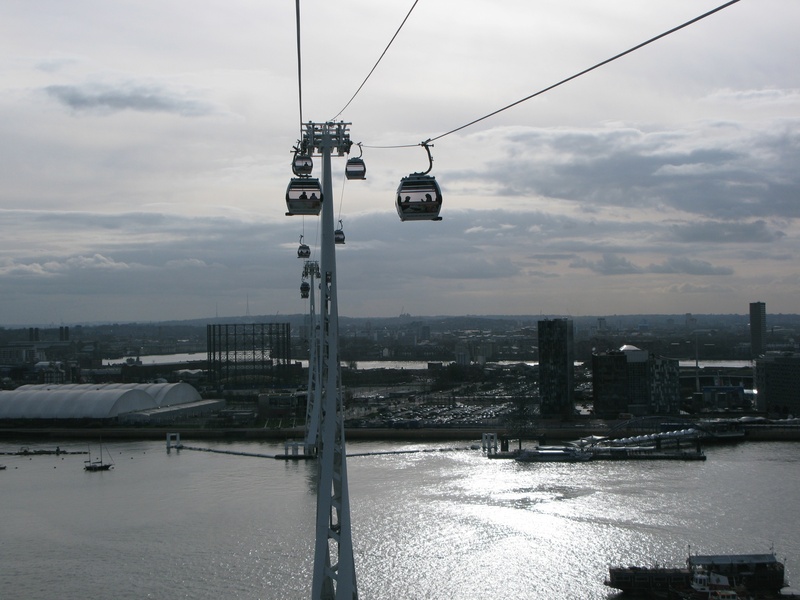 We continued our foray east on the Docklands Light Railway, all the way to the Emirates Air Line, a gondola built across the Thames to North Greenwich. The last time I was on one of these was with a snowboard in tow; it’s a bit out of the mix of things but judging by the pace of eastward construction, it wouldn’t surprise me if it becomes a commuter route in years to come. Jackson’s a bit of a ship nut, having memorized facts about practically every ocean liner and cruise ship in existence. So Greenwich was a natural spot for him: we examined the Cutty Sark, the 19th Century clipper ship that’s been drydocked here for decades; back when I visited as a boy it was fully exposed to the elements, but in recent years it’s been partly enclosed in a steel-and-glass structure that affords entry to the underside of the ship. It manages to be most majestic and a bit fragile all at once, considering that it did global voyages back in the age of sail. Some of how that was accomplished was explained to us up the hill at the Royal Observatory, where an exhibit on longitude told the tale of how that bit of cartography was figured out. If you think about it, latitude is easy: angle of the sun tells all. But those imaginary lines running north to south along the globe aren’t parallel to each other, and in an age before airplanes and satellites, divining what was east or west of where was no mean feat. 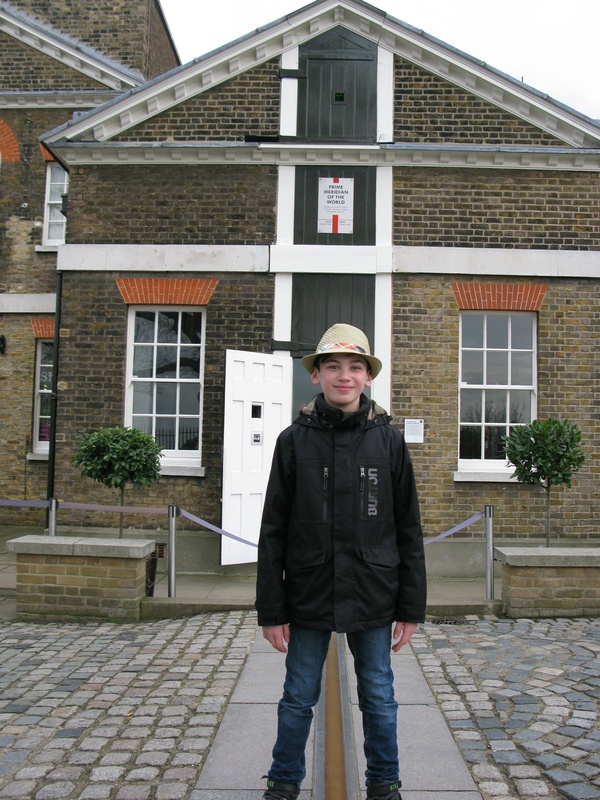 No trip to the Observatory would be complete without a stop on the most famous longitude line of all, the Prime Meridian. Leave it to those beavering Brits and their maritime technological prowess (okay, coupled with a dash of arrogance) to set the zero marker right here in their nation’s capital. Jackson stood astride both hemispheres just as I had done decades ago. A colleague of mine who’d traveled around Europe last year with his family recommended a pizza eatery overlooking the river on London’s South Bank. So…what better way to get from one aquatic spot to another than by boat? Back when I visited years ago, this was practically the only way to get to Greenwich from central London, and it was slow. 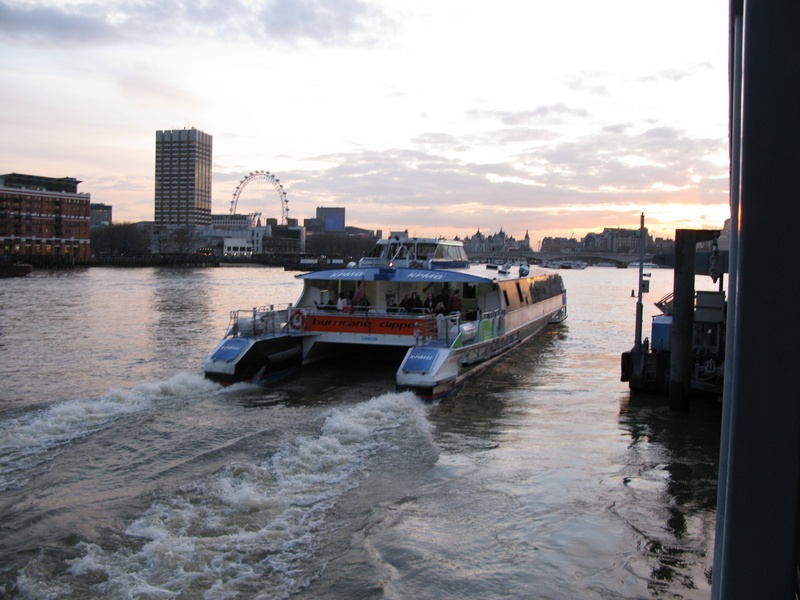 Not anymore: a bunch of high-speed catamarans ply the Thames, carrying commuters across the sprawling city. As we reached Canary Wharf, crowds of people in business attire boarded the ship. We then cruised back under Tower Bridge, past Southwark and the Tate Modern. I still recall how my family friends in London years ago referred to the South Bank as “no-man’s land.” Here too, no more: both sides of the river, once a rotting pile of industrial buildings astride a stinking waterway, have been transformed in the wake of the river’s cleanup. Factories have been converted into elegant homes; new buildings have been erected bearing both housing and workspaces; a riverwalk promenade offers opportunities for an evening stroll. We sat at the Gourmet Pizza Company and, as we had the previous evening, watched the sun go down and the lights come on in this dazzling city. “Can we go see the countryside?” Jackson asked at some point early in our voyage. I didn’t think we’d have the chance until one of my pals down in Winchester said he was free for the day. So, next morning, we hopped on a couple of crowded Tubes to Waterloo Station, where, after navigating the confusion of ticket machines and U.S. credit cards (my adopted homeland is, at long last, set to adopt the now-global EMV “chip & PIN” standard) we snagged our tickets and headed out of the city. 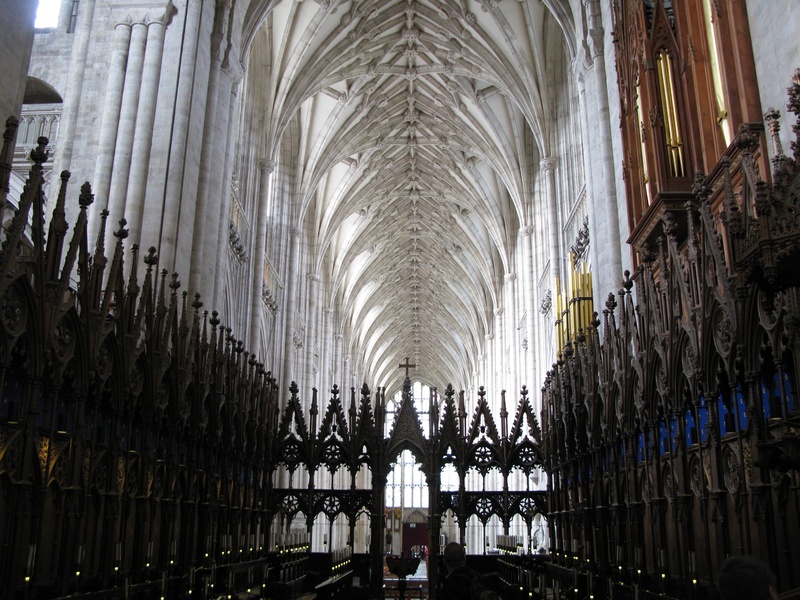 Adam met us at the station and gave us a grand morning’s tour of this little town’s sights: Winchester was once an English capital city, and pieces of its castle remain intact. It’s also the final home and ultimate resting place of one of Britain’s literary luminaries (and my mother’s — Jackson’s grandmother’s — faves): Jane Austen. We passed by the home where she died before heading to her gravesite, the church with the longest nave in Europe, Winchester Cathedral. Having spent a couple of months in Europe on my big world voyage (and after), I’d say I’ve seen more than my share of churches and cathedrals. 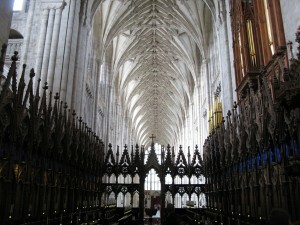 But in spite of church overload, Winchester totally blew me away (and impressed Jackson as well). Stone carvings, vaulted ceilings, a glorious wooden screen, a medieval illuminated Bible…this place has it all. Adam confessed (pun sort-of intended) that he finds this spot even more impressive (and much quieter) than Westminster Abbey. I agree, and heartily recommend this little town with the big church for a wondrous, not-as-touristic experience. 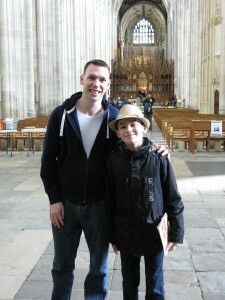 After our meander through the cathedral, we met Adam’s dad for lunch in a local pub. A mellow Aussie sort, he and I had far too much to talk about once I found out what he did for a living — which also explained how he managed to pay his son a visit from halfway around the world on a lark: he’s a pilot for Virgin Australia. As our fish & chips, burgers, and Adam’s liquid lunch of Guinness arrived, we chatted endlessly about aircraft configurations, long-haul routes, and the perils of automated flying. I’m not sure if Adam and Jackson followed along or were secretly rolling their eyes. We could have lingered in Winchester longer, but we had to get back for the next stop on the tour: a taste of West End theatre. After a meal of Indian food (what’s a visit to London without that?) we headed to the Victoria Palace Theatre for Billy Elliot, the musical based on the 2000 movie that’s long been one of my favorites. I wasn’t sure how this gritty indie film (albeit one with a Hollywood-ish “boy triumphs over adversity” theme) would translate to the stage… but it did quite nicely, with some truly arresting visuals (the miner’s lamps shining in the dark in one number: chilling; the bit where young Billy dances with his future self to Swan Lake: magical), and a political subtext that took some explaining to Jackson — though he’s arguably now one of the more informed twelve-year-old Montrealers on the vagaries of Thatcherism and British coal strikes in the 1980s. For our last full day in London, we mixed up sightseeing and socializing. 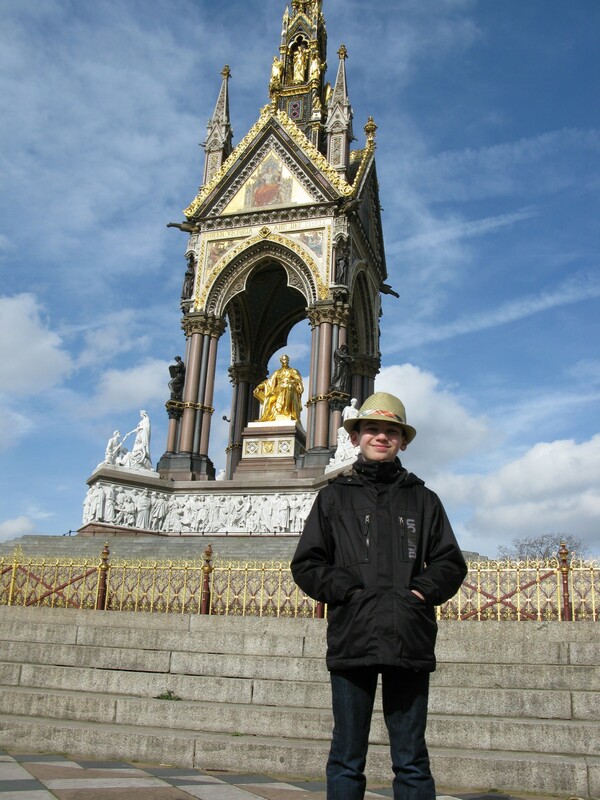 We got up a bit late, and after a quick breakfast at Pret A Manger (my go-to lite-bite hangout in London, where they’re to be found everywhere), we crossed Hyde Park under surprisingly warm, sunny skies. Passing Kensington Palace (hello, Will, Kate & company) and the Royal Albert Hall (stopping for a photo in front of the Albert Memorial — I think Jackson’s managed to be in photos in front of every landmark I posed in front of in my time here decades ago), we headed toward Cromwell Road to our day’s destination: the London Science Museum. Arguably one of the world’s oldest and most notable such institutions, the place has been greatly updated since I was here last: the classics — Foucault’s Pendulum, Stephenson’s Rocket locomotive — are still around, but they’ve been augmented by exhibits on 3-D printing, a motion-simulator 3-D theatre bearing an experiential CGI reenactment of an Apollo mission to the moon, and an IMAX theatre where we took in a gorgeous 3-D film (narrated by Jim Carrey) on undersea life that was achingly beautiful even for those who think they’ve seen it all. 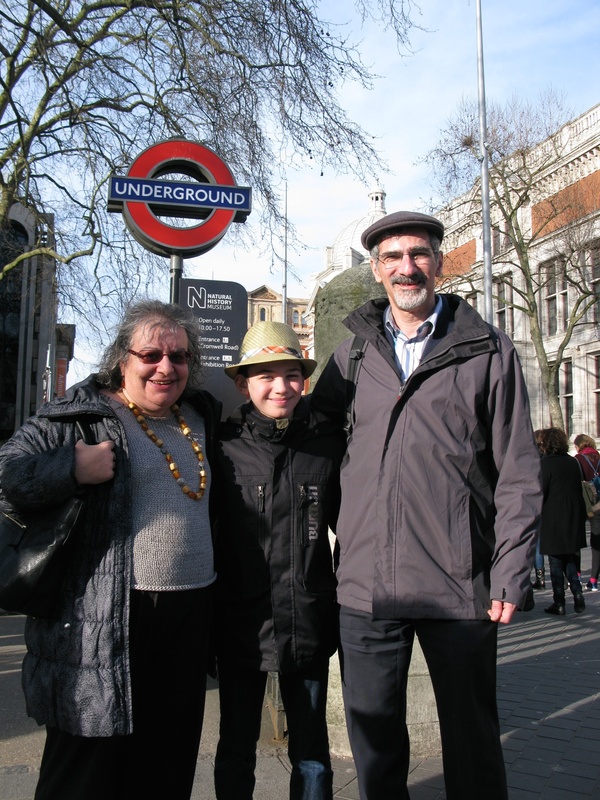 We were joined on this outing by Susan & Richard Baruch, the second generation of the London clan whose ties with my family go back to the 1950s. They even hauled us to Covent Garden, to the gift shop of the London Transport Museum (a visit to which Jackson will have to do another time — such are the constraints of short-duration travel) for the all-important “Mind the Gap” T-shirts; after a few days riding the Tube in this city, it’s a mantra no less etched into one’s skull as that song on Disney theme parks’ “It’s a Small World” ride. After another visit to Susan’s parents, another of their daughters, Joy, took us for a splendid meal of Thai food (with a stop for some uber-rich chocolate ice cream for dessert) in trendy Camden. London never ceases to amaze me with its bustle, its diversity, and the dynamism of its inhabitants. Our time here was brief but, as always, fabulously memorable. Great post. 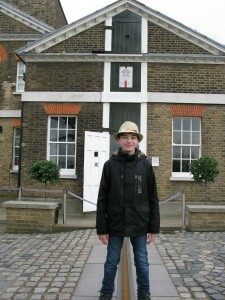 Brings back memories, though I was all of 14 on my first visit to London. Thanks. Oh fabulous London, my favourite city and one that changed my life! great adventure, David and Jackson. I was with you in spirit all the way!! © 2009–2019 Holistic Ideas, Inc. — Cutline theme design by Chris Pearson.